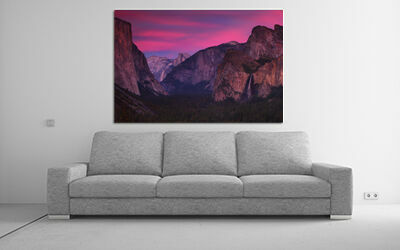 It's not hard to see why the Yosemite Valley has inspired so many artists. Legendary landscape photographer Ansel Adams traveled all over the United States capturing the majesty of the National Parks. Yosemite though, was always closest to his heart. The late Galen Rowell, also one of the all time great lanscape photographers called the area in and around Yosemite his home, both as a photographer and an adventurer. 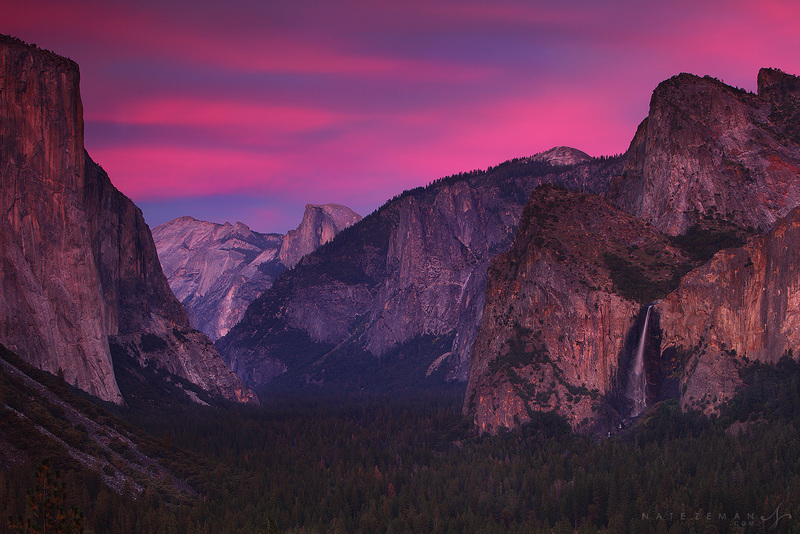 Tunnel view, one of the parks more iconic lookouts, is a photographer's dream. Looking straight down the glacially carved valley, many of the parks most famous icons are in view. In the distance is the unmistakable monolith, Half Dome. Dominating the foreground to the left, is the giant, El Capitan. To the right is Bridalveil Falls, a 617 foot waterfall that comes from one of Yosemite's many hanging valleys. Typically, Bridalveil will fall from top to bottom, but on this evening the wind was blowing, causing the falls to scatter into the rocks of the cliff. This was truly a light show to remember. 10 or so minutes after the sun had gone below the horizon I was ready to pack up my gear and head back. Sunset had been decent and now the sky was dull and flat. Then, high altitude clouds began to catch the sunset light. The clouds danced in the light for a few minutes, changing from different shades of blue, pink and purple before my eyes. The light on the clouds was so intense that they were casting their own secondary light on the valley below, creating the illusion of direct sunset light. The light faded as quickly as it appeared, leaving me just enough time to capture a few images of this unforgetable evening.